The first custom-engineered crawl space drainage pipe! Our SmartPipe™ system will keep your crawl space dry, ensuring your home's structural integrity. Click to enlarge. During rainy weather and flood conditions, water can leak into your crawl space through vents and doors. Plumbing leaks and condensed moisture are other ways moisture infiltrates your below-grade space. Wet crawl spaces with pooling water, damp walls, and muddy soils are a big issue. Unlike basements, crawl space leaks can go unnoticed for months, or even years, leaving rot and mold to grow rampant and leading to expensive repairs later on. At Regional Foundation Solutions, we specialize in solutions that keep your crawl space healthy and dry, offering the superior SmartPipe™ crawl space drain pipe. If you're experiencing moisture issues with your crawl space, we offer free estimates in Greater Raleigh, North Carolina, including Durham, Raleigh, Greenville, and surrounding areas. Wet crawl spaces with standing water stains, muddy soils, and leaky walls are no match for the SmartPipe™ Crawl Space Drainage System. Its custom design includes holes on the top and in front to accept water from the soil and surface of your crawl space. A special wall flange collects water from crawl space walls and footings/wall joints. The SmartPipe™ is also the ideal way to drain water in a dirt crawl space without clogging or drain failure. 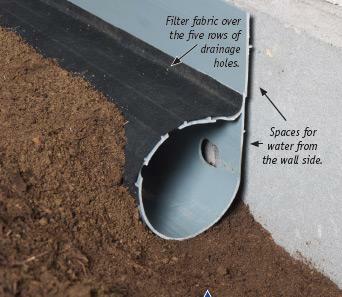 All openings facing the dirt surface include a special filter fabric material, designed to allow water in while keeping mud and other clogging debris away. The SmartPipe™ system installs quickly, in a day or less. When we send a crew to encapsulate your crawl space, one worker can be installing your drain while the others install the rest of your crawl space system. Regional Foundation Solutions can help you have a healthier crawl space and home with our crawl space water draining SmartPipe™. Schedule a free estimate to get started! We service Durham, Raleigh, Greenville, Rocky Mount, Chapel Hill, Cary, Apex, Henderson, Elizabeth City, Wilson, and nearby areas in Greater Raleigh, North Carolina.